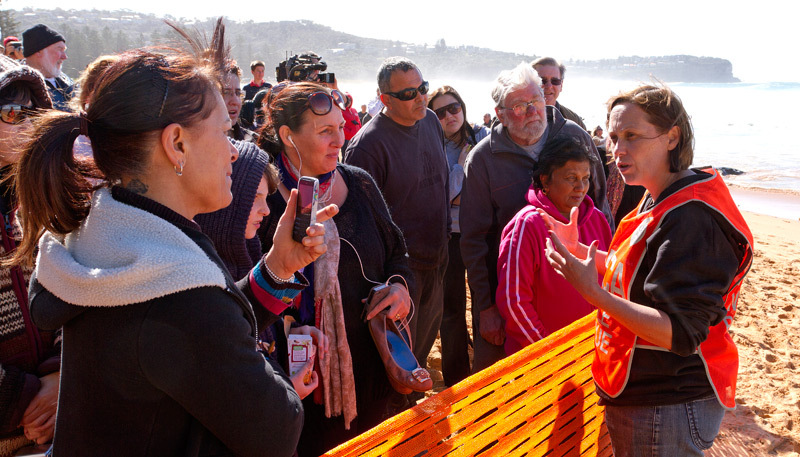 The huge seas that had crashed along the coast for days brought a large surprise for the early morning beach walkers at Sydney’s Newport Beach. 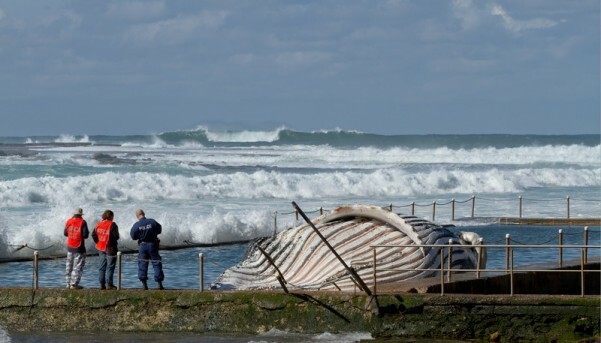 A ten meter sub adult Humpback whales carcass had washed ashore overnight and in what can only be described as a tragic hole in one had ended up in the Newport Ocean Swimming Pool. 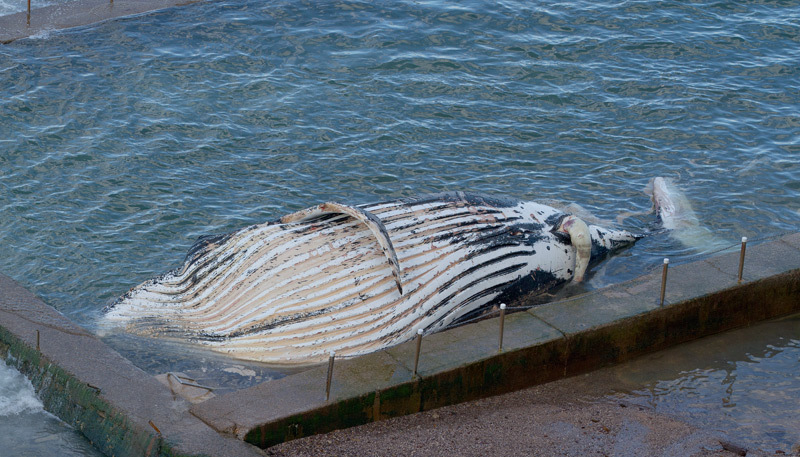 The whale had already been dead for some days before coming ashore, probably dying somewhere out to sea south east of Sydney. 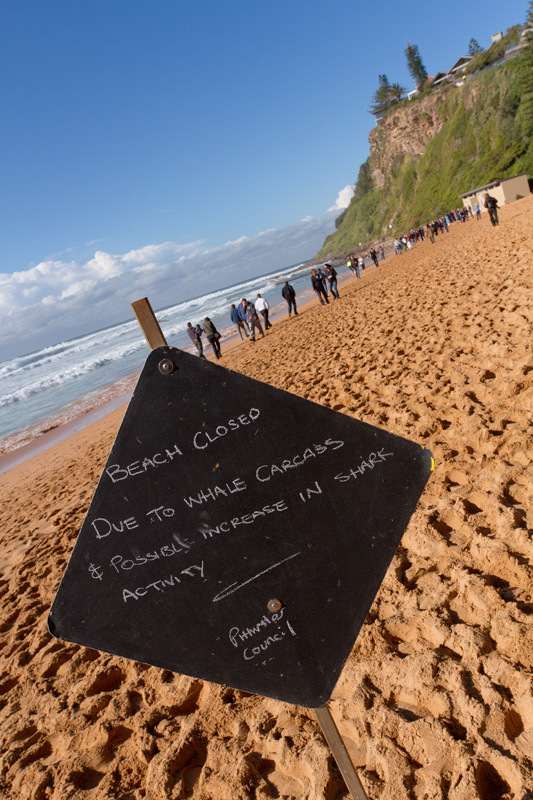 Although it was a very sad sight to see Geoff Ross from NSW Parks reminded us that as whale numbers recovered we were more lightly to see things like this. 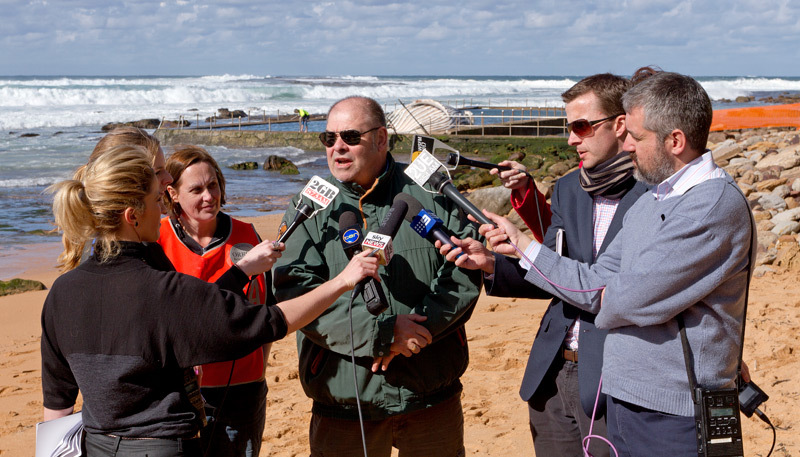 “It’s not unusual at this time of the year to see dead humpbacks. Off Sydney, we’re looking at the tail end of the humpback migration and it’s at this time of the year that we start to see the sick and infirm animals coming through – the animals that just won’t make it in the population. And having to fight against these big seas is really taking its toll and some of those animals will die offshore. Generally, they are dealt with by offshore predators such as sharks but, of course, when the seas are very rough and [there are] strong winds, it blows the carcass in shore very quickly. Over the day a constant stream of people came to see the whale. ORRCA volunteers chatted with the crowd, answering their questions, as a large media contingent covered the spectacle. The fact that the whale had ended up in the pool presented a significant and smelly problem for the authorities. It was finally decided to remove the fencing from the pool and hope that the very high tide and large waves that deposited the whale there would also wash it out. If this did not work it would be a nightmarish problem to resolve! Much to our amazement and to the delight of the authorities the high tide and waves succeeded! The whale’s body floated out of the pool. Again for the second day the morning light brought a surprise. 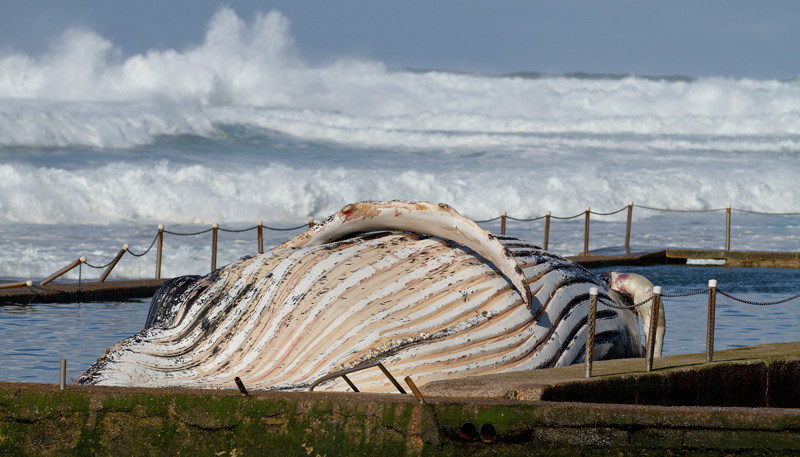 The whale’s body had now moved to the centre of the beach. This location would allow the safe removal of the carcass. Tissue samples were taken by Taronga Zoo staff and the carcass cut up into manageable pieces by NSW Parks and Wildlife for land burial.